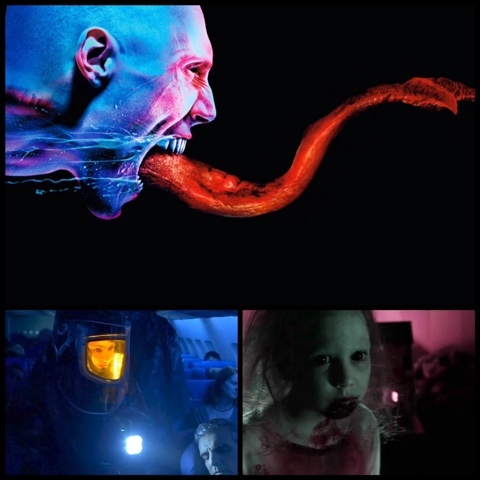 The Strain Tv Series. Production companies Double Dare You, Carton Curse Productions, FX productions. Created by Guillermo Del Toro. Distributed by 20th Century Fox on the FX network, from 2014/2017. 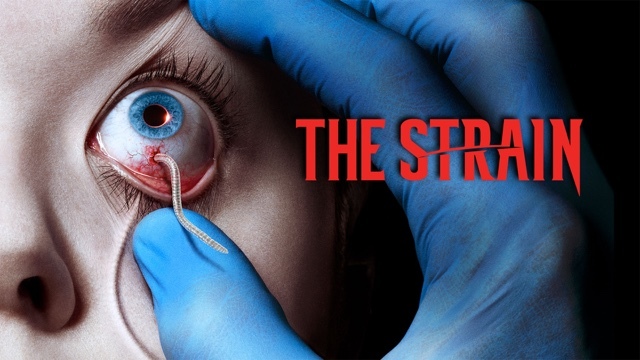 The Strain on the other hand is probably one of the best series to be seen on TV featuring Vampires, probably the best since Salems Lot in 1978, then again it is created by the director of the best Blade film Blade 2 and other great movies such as The Orphanage, Pans Labyrinth, Hellboy, Devil's Backbone, and that is Guillermo Del Toro, with the series based on his first published book of the same name. A series that is very cleverly told from the point of view from the C.D.C (Centre Of Disease Control) about a viral outbreak, that turns humans into blood hungry savages, but the word vampire is barely used in this. When a plane lands, but with a blackout on board, and scans proving no life left on board, the C.D.C is sent in to investigate a potential terrorist plot, as everyone seems to be dead on board, with no apparent cause of death. A mysterious crate is offloaded off the plane via a secret organisation, who seems to control all of New York and all the authorities, the bodies of the dead disappear under the noses of the C.D.C, and four survivors from the plane, have dramatic changes changing into something not human. With three members of the C.D.C Ephraim Goodweather ( Corey Stoll) Nora Martinez ( Mia Maestro) and Jim Kent (Sean Astin) trying to stop this outbreak with the help of an elderly gentleman who has done battle with the viral outbreak before Abraham Serakian ( David Bradley) an elderly Van Helsing character. With shady organisations of these blood hungry beings, parading as human, and controlling huge organisations and with mass amounts of wealth, can these four people stop an outbreak that could potentially destroy all of mankind, with odds against them at every corner, as this organisation holds so much power over the authorities. Running now over three seasons, 36 episodes so far,with a final and forth season renewed to air in summer of 2017. A brilliant series, and has everything I enjoy to watch, horror, bloodshed, being told from a scientific point of view, shady organisations that control the world as we know it, and generally likability from all the characters involved, especially Corey Stoll who is unrecognisable in this, as he has hair, and is normally bold in real life, but is literally the life force, and the human element to stop this evil,for the sake of humanity, is what makes this series so watchable. After seeing an interview with Guillermo Del Toro about these monsters he has created, and his enthusiasm about them, like a boyish boastful charm is why I gave this show a go. Especially when talking about the monsters feeding " they are actually shitting as they drink your blood" Del Toro enthusiastic tells the interviewer, is why this series is so good, with a creator who has that much enthusiasm for the topic of vampirism, and monsters in general is why this show is so good.